Be the first to share your favorite memory, photo or story of Tammie. This memorial page is dedicated for family, friends and future generations to celebrate the life of their loved one. Tammie Varnesta Milton, 55, of Quincy, Florida transitioned from labor to reward on Saturday, March 31, 2018. She will be deeply missed by all who knew her. A service of celebration will be held on Saturday, April 7, 2018, 11:00 A.M., at Antioch Missionary Baptist Church, 1003 West Clark Street, Quincy. Interment: Sunnyvale Cemetery, Quincy. WILLIAMS FUNERAL HOME is providing services for the Milton family. 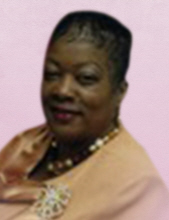 To plant a tree in memory of Tammie Varnesta Milton, please visit our Tribute Store. "Email Address" would like to share the life celebration of Tammie Varnesta Milton. Click on the "link" to go to share a favorite memory or leave a condolence message for the family.